Strange Adventures in Infinite Space was the first game of its kind: a Rogue-like space adventure. 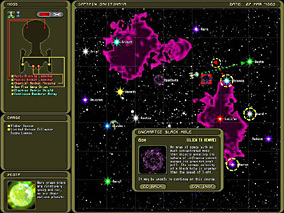 Dubbed “A Perfect Short Game” in a Gamasutra article by Ernest Adams, it gathered critical acclaim and eventually spawned a much awaited sequel Weird Worlds: Return to Infinite Space that brought this style of gameplay to more modern systems with OpenGL graphics and award-winning audio track. Strange Adventures in Infinite Space is also an example of the scratchware concept: professional quality, original games with high replayability, made by just a couple of people with freeware tools for no development cost.